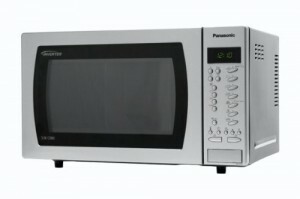 The Panasonic CT-559WBPQ combi microwave is finished in white, features 1000 Watts of power when in microwave mode, and offers 27 litres capacity. Looks good, slim profile, works well Can only be set in ten second increments. A minor complaint. 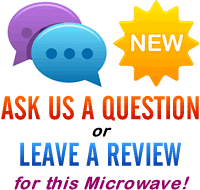 After a reliable yet cost effective combi microwave oven? The CT-559WBPQ from Panasonic offers 27 litres of capacity, 1000w of power and is finished in a smart white exterior. It's slim profile means it takes up 20% less space than the majority of other microwaves on the market, thus saving kitchen space. The convection oven mode provides 1300 watts of power, and cooks well - the cooking temperature ranges from100-250C degrees. The grill mode also provides the 1300 watts of power, and is fast to heat up. You'll find yourself using your regular grill and oven a lot less once you start using this appliance. It features 10 different auto weight programs, which comes in extremely handy, and saves having to calculate cooking times. Other features include a child lock facility, and a stainless steel lining for easy cleaning. The buttons are pretty well labelled, and the display is clear even in a brightly lit environment. As with the rest of the Panasonic range, the Chaos defrost system works extremely well, and defrosts without cooking the food. Overall it is very reasonably priced, and cooks well - all of our testers were positive about this model. Reliability shouldn't be an issue - in our experience Panasonic appliances work extremely well, and last a long time. Finally, if you're still unsure, this model won best buy in Which's 2010 survey - trust us, it's good. Overall, this microwave is well worth taking a closer look at - it features a huge amount of functions, yet is simple to use and works well. Please could you tell me if the grill is the heat which is used when in convection mode, or is the grill separate? The modest sized R662KM 20 litre grill microwave from Sharp offers a 1000w grill, and weighs just 11.4kg. The 20 litre Russell Hobbs RHM2017 is finished in a silky silver and mirrored door exterior, complete with a 800w power output and 5 different power levels. A powerful mid sized 900w microwave, featuring a 25 litre capacity, 8 auto cook functions and a silver finish, the Sharp R372SLM is well worth considering for a mid sized household needing a solo microwave.